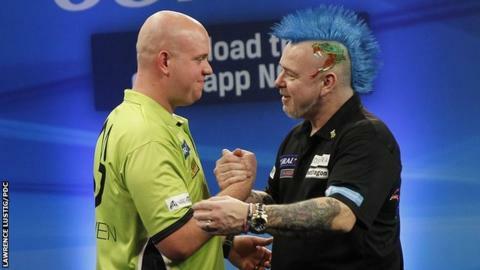 World number one Michael van Gerwen beat Peter Wright 11-4 in Minehead to retain his UK Open title. The Dutchman, 26, overcame Scotland's Wright in a repeat of the 2015 final to win the tournament for a second time. Suffolk-based Wright, 45, is yet to win a major televised PDC event. As well as the £60,000 winner's prize, Van Gerwen earned an additional £10,000 for hitting the eighth nine-dart finish in UK Open history. He achieved a perfect leg in his fourth-round victory over Rob Cross. Wright almost matched Van Gerwen's feat in the final, but missed an attempt at double 12 for a nine-darter of his own. Amateur qualifier Barry Lynn produced the shock of the tournament, defeating world champion Gary Anderson 9-3 in the last 32. Lynn had knocked out former World Grand Prix finalist Brendan Dolan in an earlier round and eventually reached the quarter-finals, when the Braintree thrower's run was ended by Van Gerwen. The Premier League resumes on Thursday, with league leader Van Gerwen due to face Dave Chisnall in Nottingham.